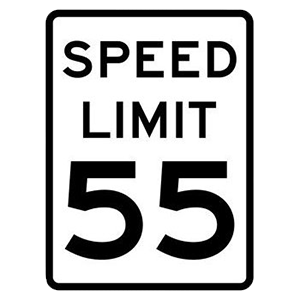 Regulation signs regulate traffic speed and movement, displaying rules which drivers must obey. 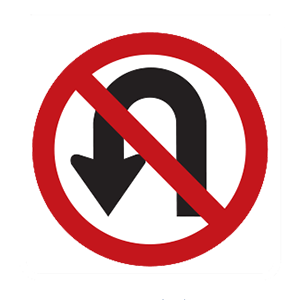 Wherever this regulation sign is posted, U-turns are not permitted. Turn into the lane closest to your previous lane. Turn into the lane marked with an arrow. Turn into the middle lane. 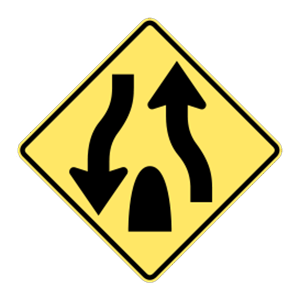 When turning onto a street with more than one lane moving in the direction that you are traveling, turn into the lane that is closest to your previous lane. Do not change lanes when turning. If involved in an accident, you should stop your vehicle immediately. If possible, move the vehicle out of the way of traffic. Call the nearest police agency and ask for an ambulance, if necessary. Do not move the injured unnecessarily, but attempt to stop severe bleeding with direct pressure. Wait for emergency vehicles to arrive.